Well, to begin with, he wears a ring with a spooky symbol on it. It’s got a circle with an X through it, and it’s hot off the finger of a witch doctor from the dark jungles of Brazil. So either Quentin is a fan of The X-Men or he’s a Satan-worshipping serial killer, and I haven’t seen a lot of comic books lying around, have you? I mean, there was more evidence than that, probably. Mordecai Grimes said that Quentin followed him through the woods and then he just stood there and got shot at, so that’s suspicious. Also, he left the house to chase after Randall, and Gabriel said that there was a look on his face. A look! Well, you can’t just go around with a look on your face; people are going to notice, and take steps. In this case, they’re going to come to the inevitable conclusion that Quentin Collins murdered Randall Drew. They have no choice. 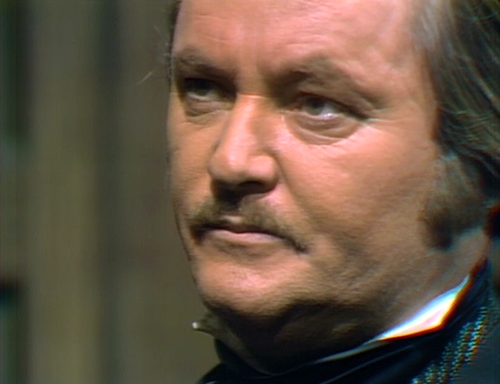 “I have no choice, Mr. Collins,” explains the constable. “You are under arrest for murder.” And he is, eventually, but they go the long way around. 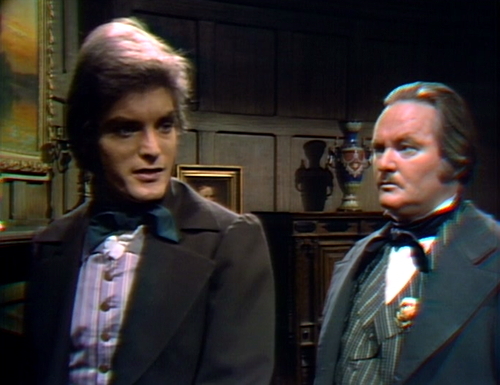 Now, the comforting thing about being arrested on Dark Shadows is that the conviction rate is extremely low; the only person who’s ever been punished for a crime was Victoria Winters, and she escaped anyway. They even hanged her twice, and it didn’t stick. She just laughed at them. She liked it. 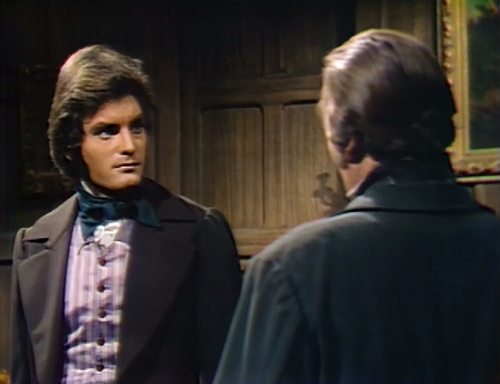 Jim Ward is the last constable that we see on Dark Shadows, the conclusion of a long line of ineffectual sheriffs and deputies and gaolers and lawmen. There was Jonas Carter back at the beginning, who thought that Burke was innocent but sent him to prison anyway; there was George Patterson, who spent three years investigating a bizarre string of crimes that should have had a logical explanation but didn’t; and there was Sheriff Davenport, who was turned into a zombie, and got torn to shreds by a werewolf. There was a Deputy who almost got bitten by a lady vampire, and an Inspector in Parallel Time who went down into the basement with Barnabas and just stayed down there, polishing his skis. They never solved much of anything in the way of crimes; they were mostly atmosphere. And here we are, in the past, with this crime-fighting contender, who thinks he can walk up to Quentin Collins and have no choice. It’s a good thing we don’t have a werewolf anymore; this guy wouldn’t even last two rounds. Naturally, Quentin finds the prospect of being arrested difficult to believe; he’s a white male landowner in the 1840s, and he has other items on his agenda. “That will all come out at the trial,” says the constable, which is the only professional thing he’ll say all day. “Now, what reason would I have for killing that man? Can you tell me that?” Quentin explodes. “A man has to have a motive for murder!” He apparently believes that being arrested is the first step of a negotiation. “Well, of course I might have! But I don’t!” Quentin snaps, and the defense rests. “Of course,” says Jim. “But try to make it brief, Mr. Collins.” And then he excuses himself, and waits out in the hall. Now, I’m not a police officer and I don’t watch a lot of procedurals, but I’m pretty sure there are several reasons why you don’t initiate the arrest process, and then step out of the room for a moment. The optics are bad. It suggests a lack of confidence. You’re also giving the apprehended the opportunity to tamper with evidence, confer with confederates, and take a good hard look at the windows and try to remember how far away Canada is. But soap opera cops are soap opera first and cops second, and they serve a higher justice, namely: don’t get in the way of the drama. 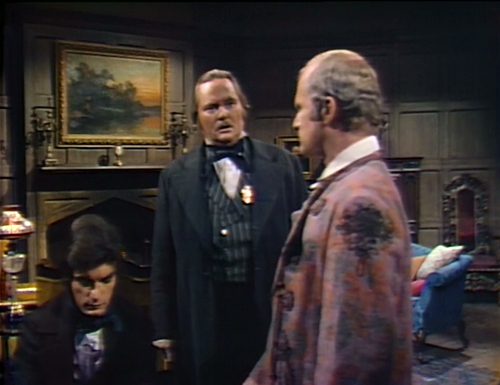 So Jim waits out in the foyer, with literal hat in hand, while the accused says who knows what to his son, who’s probably some kind of demonic familiar Quentin conjured up in his mad scientist warlock lab. So now Quentin needs to explain what’s going on to Tad, and he accomplishes it in the most confusing possible way. Tad asks if the constable is here because they’ve found the man who killed his uncle Randall, and Quentin says, “No, they haven’t found the man. A few people think they have, but they haven’t. Mr. Ward’s just doing what he must do at the present time.” Then he says, “You know that there isn’t anything I wouldn’t do to make sure that you don’t get hurt by anyone or anything,” which is a tricky sentence to wrap your mind around in a hurry. “They don’t think you did it?” Tad asks, and Quentin says, “No, but I do have to go away with Mr. Ward for a while.” So he’s going to have to either get better at telling the truth or get better at lying before they put him on the stand; this middle ground isn’t working very well. After the father-son bonding time, Jim walks back into the drawing room and asks, “Are you ready, Mr. Collins?” That’s a question that can be answered in a number of ways that Jim isn’t going to care for. Jim gives an understanding nod. 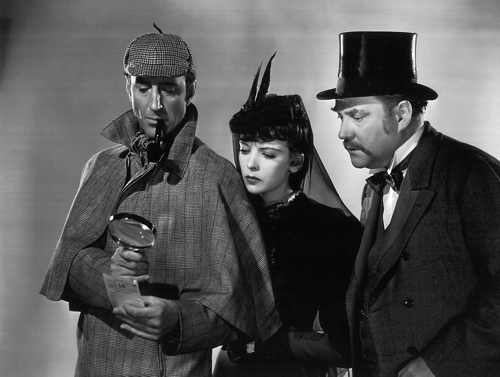 “Well, I guess a few more minutes won’t do any harm.” This is a murder investigation. Quentin heads for the door, but Jim stops him. “I’m sorry, sir,” he apologizes. “I’ll have to go with you.” Quentin allows it. As it turns out, Daphne isn’t around. Quentin looks for her in all the places where she might be destroying evidence — the fireplaces, the toilets, the bathtub full of lye — but she’s simply vanished. Quentin doesn’t know where else she could be, but the answer is obvious: she’s been murdered, by Quentin. He decides to leave her a note anyway. 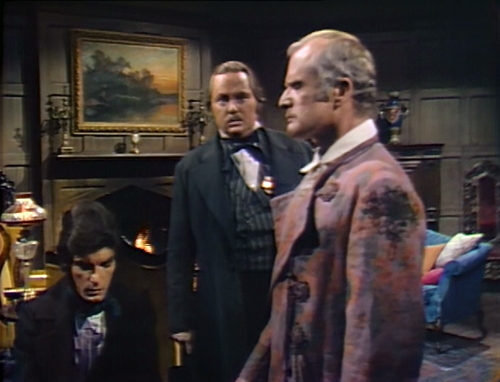 And then they do what I think is the logical conclusion of every law enforcement sequence that Dark Shadows has ever had. Here’s where it all comes together. And Jim, with an utterly bewildered look on his face, shuts up and gets out. What else is there to do? Tomorrow: When One Deals with Judah Zachery, There Is No Margin for Error. In act 1, when Quentin asks why he would kill Randall, he shoots a very obvious glance at the teleprompter. When Tad leaves the drawing room and Jim enters, there’s a brief glimpse of the camera through the drawing room doors. When Gerard opens the drawing room doors at the beginning of act 3, the boom mic can be seen overhead. After Daniel says, “You’re a fine young man, Gerard,” there’s a loud clank from offscreen, followed by a few more taps. 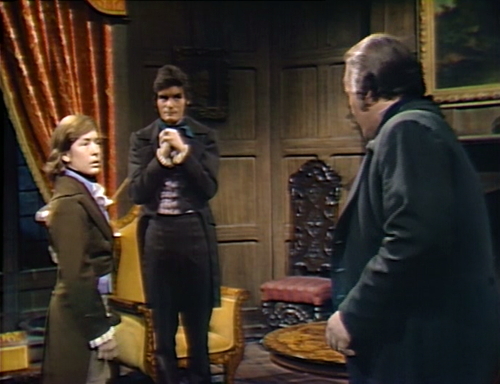 In act 4, the camera holds a close-up on Gerard as he assures Dawson that he’s planned out the seance. We can hear Dawson’s footsteps, going over to the set for the next scene. When the next scene begins, the camera lingers on a candle and then a close-up on Daniel, as we hear Gerard hurrying to the set to join them. Elizabeth Eis is back, playing Mildred Ward for three episodes. She was last seen on the show in May, playing Buffie Harrington, and before that she was a short-lived Leviathan convert. This is her last role on the show. My favorite prop, the Ralston-Purina lamp, is back at work in the drawing room today. It was last seen in October, hanging in Trask’s chapel. I’d like to find out what police procedures were at that time. I recently found out an ancestor of mine was arrested for murdering a wife in 1859. Chicago Tribune, after saying there was not much to convict him, then said he was guilty as hell because the Coroner said so. He escaped by jumping out the second story window of a hotel he was being kept at. Never caught even though he drew a Civil War pension. Sounded like an episode of Dark Shadows to me. He must have traveled to the future. Or DS remarkably nailed it with the less-than-stellar procedures in the past. Hey, even a broken clock is correct twice a day. Lawman Jim is surprisingly reticent about the case against Quentin (though true to the Collinsport tradition, he is charging the wrong suspect); any of the other officers would have given a complete rundown on the case and then told Quentin that as he’s a member of the Collins family, he can be trusted not to try to flee, and needn’t be put into the jail cell in town. Jonas Carter was in fact the only police figure in Collinsport to ever solve a crime. After examining photos of fingerprints taken from a wrench in the Collinwood garage, he rightly concluded that it was David Collins, and not Burke Devlin, who tampered with the brake system on Roger’s car causing him to run off the road. Although he didn’t want to, Carter knew that he had a job to do in bringing these facts to light. 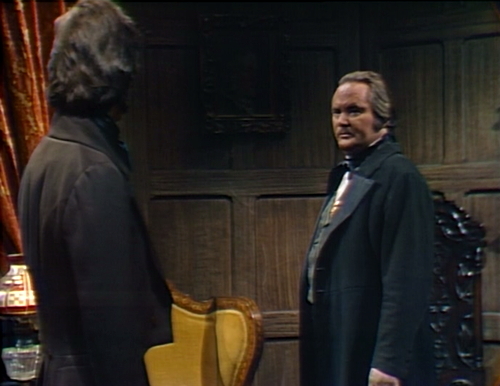 Having paid a visit to Collinwood to present his findings, he was met with an insurmountable roadblock in the form of Elizabeth Collins Stoddard, who by this time had learned the truth herself and thought it best to protect the dignity of the family name. Mrs. Stoddard told the sheriff that the valve fell off by itself, that the caretaker had neglected to have the car serviced so that the loose valve could have been detected and fixed. Those enforcing the law in Collinsport are good men and not at all incompetent. It just so happens that Collinwood is beyond their jurisdiction. Jonas Carter was working way back when DS was still a soap opera, and not a spook show. All the others were looking for rational explanations for the increasingly irrational activities in and around Collinsport. Too bad they didn’t have the HODS law enforcement; THEY jumped right in, big shiny crosses, silver bullets and a good solid stake – I don’t think any of them even tried to posit some other theory for what was going on! I don’t mean to imply that any of the lawmen in Collinsport are incompetent; but a successful outcome for them would mean that one of ‘our’ Collins family would be locked up, and of course that simply couldn’t happen. (Except to Vicki.) Sadly, the function of the police on DS was to show that the supernatural events were beyond mortal understanding or jurisdiction. And to show that you don’t mess with the Collins family. All of which I would have gladly forgiven if they’d had some burly hunky policemen in tight uniforms in there…would that have been too much to ask? The hot cops were on The Edge of Night! How many Quentins have been locked up in that jail, anyway? A Quentin Collins pulled time there in 1840, 1897 and also in PT 1970, right? They really should rename it the Quentin Collins Memorial Jailhouse. He at least deserves a commemorative plaque in the lobby. Yes, every version of Quentin (even an upcoming one) has spent time in a cell. 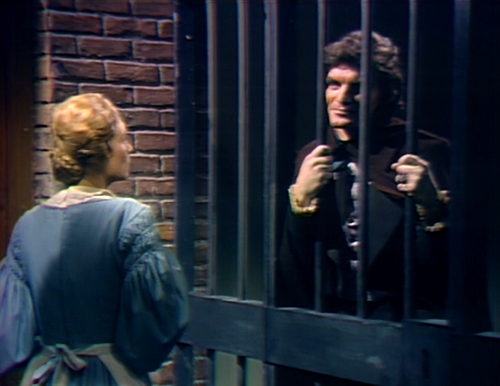 And with all the trouble Barnabas caused at the beginning, he didn’t spend one moment behind bars. I’m surprised Carolyn didn’t do more jail time. Didn’t she cause a woman to be killed in an accident while driving drunk during the Buzz storyline? I guess Liz must have called in some favors. Carolyn was on her way to meet Buzz, driving drunk, and, while swerving round a turn, lost control and nearly hit a woman by the side of the road, causing the car to crash. The woman she almost killed pulled her from the wreck just before it burst into flames, but Carolyn wasn’t the least bit sorry and instead was rude to the woman who had just saved her life.She escaped with only a badly sprained wrist. With automobile accidents, that family has the luck of the Collins. That’s right – the woman didn’t die, but saved Carolyn. I loved that episode because it was similar to some of Joan Bennett’s films. Also the episode where Liz got up the courage to finally leave Collinwood to go and get her daughter. Carolyn wasn’t very gracious about that, either. That’s why it reminded me of one of Joan’s movies. The shot where Vicki opened the doors of Collinwood, and we hear the sound of the ocean…it was perfect. It had to be especially tough for Liz to go to the cop shop since her greatest dread was ending up behind bars there herself. Which we didn’t know about until her wedding day! Such a shame that she got tossed into the fishbowl after that, with ‘all her problems solved’ and nothing to do except look stunned and say, “What do you mean? There must be some reasonable explanation for this.” And get her reset button pushed every couple of months. And then falling for scammers such as the Leviathans and the Ghost of Gerard. Meanwhile, who’s minding the mint? I guess the Collins Cannery ran itself by this point. Nonsense! Roger stepped up, becoming a globetrotting dynamo of industry. Which was why we saw so little of him, always jetting off to Europe – he made Collins Kippers number one in the UK. Ah-hah! That answers a lot of questions about Elizabeth’s mental health problems. Who benefited? Roger! Maybe he first saw the opportunity to get ahead in the family business when Laura put a spell on Liz, resulting in a lengthy hospital stay. Maybe Roger secretly suggested that Cassandra put the “buried alive” curse on Liz, sending her for a lengthy stay at Windcliff and actually being placed in the mausoleum. Maybe the whole Leviathan thing was partially his idea! The family would get so wrapped up in it that he could promote himself higher and higher at Collins Industries. Maybe he helped summon the ghost of Gerard. That Roger was one dastardly fellow! No, he was very concerned, startled, horrified, when he saw his sister Liz lying at the bottom of the stairs, in that moment when Laura’s influence had really taken hold. For all his faults, Roger did have filial piety. Of course, by that time Roger was made a great deal nicer as a character due in no small part to Louis Edmonds’ indispensable talent. And I love you both for it. It was a terrible waste of talent that Joan’s role was so diminished after Frid & Grayson took over but, she still got those zingers in. For instance, nobody but nobody could disgustedly declare, “That’s absurd” like Elizabeth Collins Stoddard could! At least the Judith role gave Joan some meat to chew on. The drawing room scenes with Judith, Edward, Quentin and Carl are some of the best DS ever produced. That’s so true. Once Judith got back from Rushmore Sanitarium, she was a force to be reckoned with! And we cheered her on! The Collins family have their own jail in the cellar of Collinwood (episodes 831 and 832); they don’t need that shabby little Collinsport Gaol. It doesn’t even have four walls, and you can climb out over the top of the bars! (Come to think of it, even the Old House has a lockup. I bet Rose Cottage has a dungeon.) Do you suppose that the basement cells were the Collins family’s version of a “mother in law’s suite”? Compare and contrast with Hugh Jackman as Wolverine; Quentin could be “Werewolverine”! And he’s got better muttonchops too. Just needs those retractable claw thingies. Remember how Danny referred to the playroom (in the summer of 1970) as a “ghost room?” Well, The Haunting of Hill House has one hell of a ghost room! Ok. While we are in a holding pattern, perhaps someone can explain this to me. I just don’t get it. I’m not sure if it’s because I’m out a touch or if it’s because this is just really incoherent. But it has a high cuteness quotient. And strangely enough it does have a vampire name Barnabas. I think it is just really incoherent. I don’t even see the high cuteness quotient. From my private room here at Wyndcliffe, the video seems quite coherent. Oooooo, bop, bop, bop, bop! I wonder if Mrs. Johnson served a boiled turkey on Turkey Day. I guess Minerva will bring along some plum preserves. Just stay away from Tim Shaw’s ‘special blend’ of tea! Just wait til Christmas when Mrs. Johnson can’t make fruitcake cause Quentin drank all the brandy. Christmas at Collinwood – beware opening your presents! Especially any gifts fromAngelique: there’s the voodoo doll wrapped in a cobweb for the guys and Love Potion #9 Rosewater for the ladies. And Josette’s Secret Santa always gives her a hairy skull. No worries – Mrs. J. can just substitute the brandy out with homemade mayonnaise! I’ll send them the ftuitcake that we found in the freezer after we closed on our house couple weeks ago. I’m not kidding. There were 4 containers of candied fruit and a store-bought fruit cake. We were going to leave the fruit cake for the next owners when we sell in 10 to 15 years. However, I’d happily send it to Collinwood if fhey have an interest. By the way we had sone house hunting disappointments. Missed out on the historic houses including the 1885 one with the servants’ stairs. Chose not to pursue the 1850s Bed and Breakfast conversion with multiple Live Oaks. Sadly, we passed on the modern house whose exterior was a 90% match for Rose Cottage partly because having an outdoor pool by a lake was more than we figure out how to manage correctly. Congrats on the new house! Let’s hope the previous owners left you some more surprises – like some vintage bottles of wine! Check the cellar for bricked-in alcoves or locked rooms with uneven flagstone floors. Yeah, but don’t get too excited if there are bats in the eaves. We had some bats and not a single one of them materialized in my bedroom in human form, wantint to bite my neck. My husband would be delighted to see bats. He’s rather fond of them. One summer in Colorado he took part in the volunteer count of bat species in the active mines of the Colorado mountains. Alas, no cellars or basements. The water table is fairly high in North Carolina so basements are rare. A little couple of the houses we looked at did have them. I have a vague hope of finding something interesting with the metal detector. We had a 1904 house in the Denver area. Are dog dug up some old glass bottles maybe from the 20s. The owner did leave us the blueprints. Apparently the home is from some sort of pre-bought blueprints that may have come through Montgomery Ward. Or maybe not. The envelope that the blueprint came in seemed to indicate that it did however some thrifty person may have just stuffed blueprints into whatever envelope they had on hand when mailing. I know Sears & Roebuck sold ready-to-build kits; my brother bought a 1920s one a few years ago. I will bet that Wards also had models available. I would be more interested in the turkey club sandwich they probably have on the menu at the Collinsport Inn restaurant, especially since I have a thing for the waitresses who work there. With Maggie Evans and Silent Susie 1 and 2, it’s easy to see why Burke Devlin made Collinsport Inn his main base of business operations.